The carcass re-hanger is designed for automatic cutting of feet and rehanging carcasses from the slaughtering line to the evisceration line. The chicken weight range is 800g to 2,500g, but it must be kept in mind that for proper functioning of the re-hanger the batch weight range must be balanced. A shaft with a chain wheel of the slaughtering line with the plate of the automatic foot cutter mounted on it. The slaughtering line and the evisceration line shafts are fitted with transmission and rotation generator, which are connected with the electronic control system of the machine for synchronising speeds of both lines. 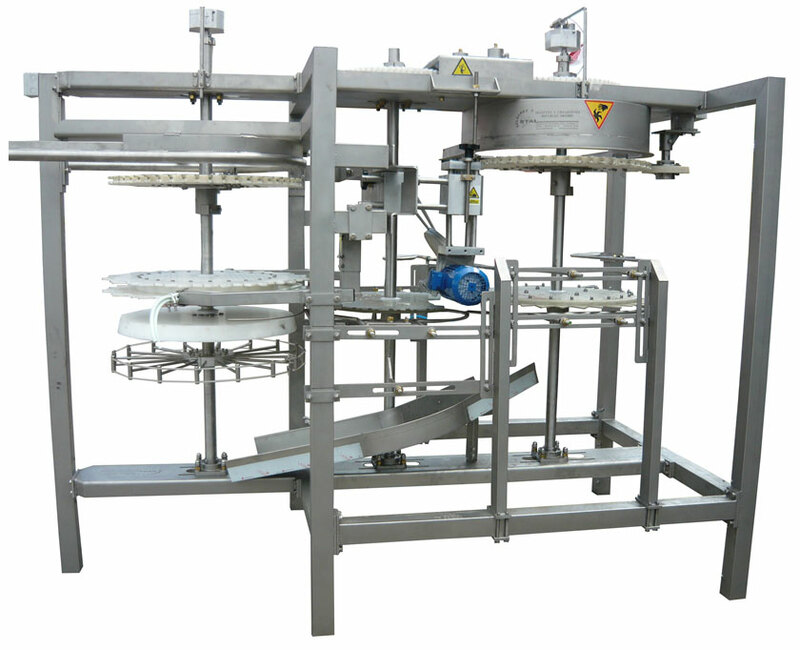 The re-hanger is directly connected with and powered by both the slaughtering line and the evisceration line, whose speeds are synchronised by the electronic control system. Chickens enter the re-hanger from the slaughtering line. Then the cutter automatically cuts their feet, which releases them from the slaughtering line. The central shaft transfers them to the evisceration line.